Authorized Car Service Center Market size was valued at over USD 200 billion in 2017 and is estimated to exhibit over 3% CAGR from 2018 to 2024. Continuous growth in the number of passenger cars in operation on roads is primarily driving the maintenance repairs industry size. Repair workshops offering competitive rates along with quality add-ons will attract more consumers. Customers may approach certified workstations offering various annual maintenance plans along with discounts on preventive and predictive maintenance, resulting in increased business. An upward trend in the auto after-sales services market size is witnessed owing to the steadily improving passenger car quality, from major manufacturers. The improving relationships between car manufacturers and service providers will make the availability of spare parts easier resulting in faster repairing, thereby gaining customer traction. Moreover, the increasing average vehicle age across various nations will positively affect the industry growth during the study period. Stringent carbon emission rules and regulations, such as Environment Pollution Control Authority (EPCA), is boosting the business revenue. Moreover, strengthened government machinery including remote sensing machines to keep a check on such rules is driving the certified auto-mechanics industry revenue over the study period. Infrastructure development may add more vehicles on road providing an impetus to the certified garages market revenue growth till 2024. Appropriate business model, decent attitude of the service advisor, and cost-effective services together with the rising sales of cars will surge the industry revenue in the coming years. Unscheduled repair services and replacement of tires & spare parts may result in the higher expenses for customers. In addition, technological advancements, rising vehicle complexities, labor rates, and requirement of technical expertise will further increase the maintenance and repair cost for the passenger cars across the globe. 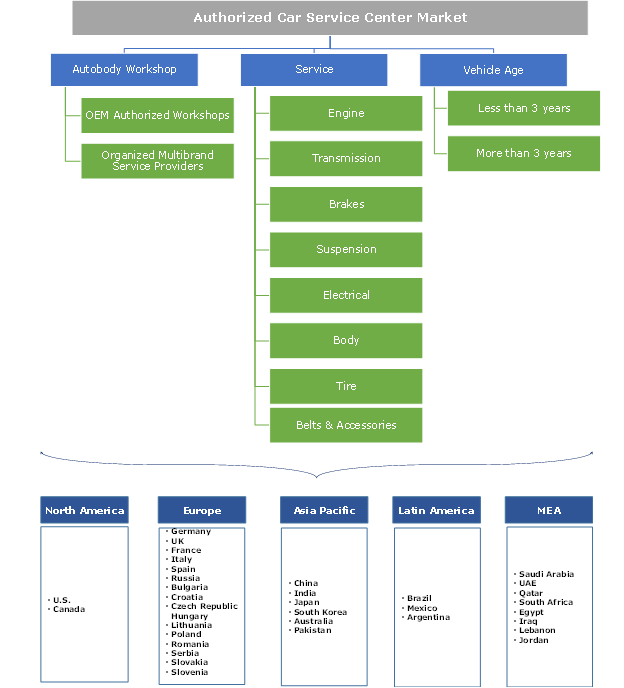 OEM authorized workshops segment from authorized car service center market size is expected to hold around 12% of the revenue share over the study time span. This can be credited to new passenger cars sales across the globe. Multi-brand service outlets segment will pose a CAGR of over 3% from 2018 to 2024 owing to customers preferring this channel after the vehicle is aged more than three years. These workshops provide economical car services and are in proximity to homes, further strengthening multi-brand servicing networks across the globe. Organized multi-brand car service players are targeting to enhance customer experience and develop trust. Electrical segment of the authorized car service center market size will witness a robust growth rate of over 4% over the forecast time frame. This can be attributed to continuous improvements for enhancing efficiency of the passenger cars. Increasing electrical content to reduce the overall vehicle weight and the need to minimize carbon emissions will further drive the segment growth till 2024. Body segment from the authorized car repair garages market size is projected to hold considerable industry’s revenue share over the projected time frame owing to prohibitive cost of the auto body parts. In addition, during accidents and collisions, the body is the most affected part, contributing to a major revenue share. Increasing number of accidents and congestions on roadways will result in enhancing the industry size over the study timeframe. Passenger cars with an age of less than three years are observed to enter authorized car repair garages due to multiple benefits offered including insurance policies and discounts. This segment is predicted to pose over 2% growth rate from 2018 to 2024. Vehicles with age greater than three years prefer to approach multi-brand vehicle repair centers due to low servicing price benefits and their availability in nearby areas. 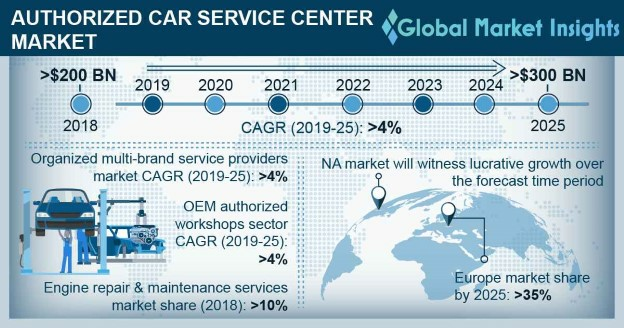 Europe authorized car service center industry was valued at over USD 77 billion in 2017 and is estimated to continue its dominance till 2024. This dominance can be attributed to the presence of major industry participants and the number of new passenger cars sales. Additionally, the increasing passenger car age across various nations will significantly contribute in the industry growth rate during the forecast period. Asia Pacific authorized car service center market share is anticipated to pose around 4% CAGR between 2018 and 2024. This can be credited to the rising disposable income across various nations that results in buying of more individual vehicles. The authorized car service center market players are Bosch, 3M, Renault, Volkswagen, BMW, Hyundai, Honda, Mahindra First Choice Services, Castrol, MyTVS, Mobil1, Carz Care, and Carnation Auto. Industry participants are emphasizing on securing contracts with the automobile companies for bringing lucrative businesses. However, customer service excellence along with added value including warranty on spare parts and lubricant analysis for servicing is the key to maintaining business loyalty. Various multi-brand garages are starting in tier 2 & 3 cities of different nations, stimulating the authorized car service center industry size. The presence of advanced machinery & tools along with skilled technicians will further enhance the industry penetration. Stricter government regulations associated with carbon emissions from aged vehicles will make the owners either to service or modify their vehicle parts at certain intervals, resulting in enhanced revenue over the forecast time span.